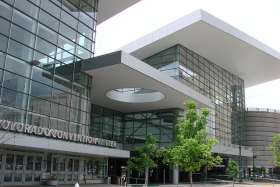 Next week, Matt and I will be attending the 2014 SEG Annual General Meeting at the Colorado Convention Centre in Denver. Join the geo-tweeting using the hashtag #SEG2014 and stay tuned on the blog for our daily highlights. I spent a couple of hours yesterday reviewing the conference schedule in an attempt to form an opinion on what deserved my attention. The meeting boasts content from over 1600 abstract submissions which it has dispersed over three formats: oral presentations, poster presentations, and oral discussions/e-posters (looking forward to finding out how these work). Any given moment there will be 12 oral, 3 poster, and 6 e-poster presentations going on, not to mention all the happenings on the exhibition floor. A worthy test for my navigation skills, discipline, and endurance, as well as the new and improved SEG events mobile app. Christof Stork (ION Geophysical), The decline of conventional seismic acquisition and the rise of specialized acquisition: this is compressive sensing. Sergy Fomel (UT Austin), Recent advances in time-domain seismic imaging. John Etgen (BP), Seismic adaptive optics. Kurt Marfurt (Univ. of Oklahoma), Seismic attributes and the road ahead. Reinarldo Michelena (iReservoir), Flow simulation models for unconventional reservoirs: The role of seismic data. Andreas Rüger (Halliburton), A practitioner's approach to full waveform inversion. Lewis Li (Stanford), Uncertainty maps for seismic images through geostatistical model randomization. Kevin Liner (Univ. of Arkansas), Study of basement rocks in Northeastern Oklahoma with 3D seismic and well logs. Xinyuan Luan (China Univ. of Petroleum), Laboratory measurements of brittleness anisotropy in synthetic shale with different cementation. Anya Reitz (Colorado School of Mines), Feasibility of surface and borehole time-lapse gravity for SAGD monitoring. Cai Lu (Univ. of Electronic Science and Technology of China), Application of multi-attributes fused volume rendering techniques in 3D seismic interpretation. To top it all off on Thursday afternoon, Matt and I will be at workshop number 9, Latest Developments in Time-Frequency Analysis. It is one of many post convention workshops worth sticking around for after the booths get torn down and the the exhibition doors close. If you read The Leading Edge frequently or if you visit the SEG website regularly, you may have noticed an increased presence of SEG Wiki. Matt and his allies Isaac Farley and Andrew Geary will be parked in Room 708 between 12–2pm and 5–6pm October 26–29. For more information about SEG Wiki and the Wikithon, check out Isaac's article from the September issue, and find out all the details on wiki page (naturally). Workshop 8: Nodes and Beyond — Hardware, Creative Geometries "...and so on." Anisotropy P1 — Orthorhombic = Layers + Cracks. "There's so much math in this session, it's even in the name." Gravity and Magnetics E-P1 — Thought-Provoking Applications "...and other miracle cures." Passive Seismic (PSC) 4 — Microseismic Smorgasbord "...enough microseisms to feed the whole family!" AVO 1 — New Wrinkles on Old Techniques "You're not getting older, you're just getting new wrinkles." Well, they got my attention. And with so much content to choose from, maybe that's all that matters. Image by user bonjourpeewee on flickr, licensed CC-BY-SA.